NEW HOT WATER PRESSURE WASHER. 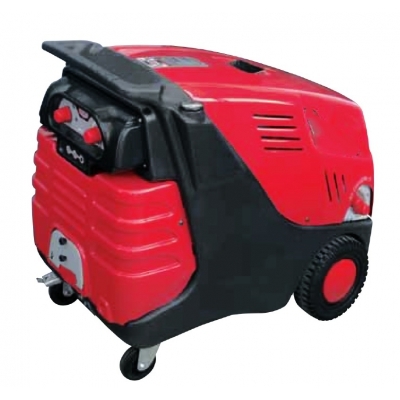 The innovative design of the Idro pressure washer features a heavy duty pump with ceramic pistons, delayed autostop, burner protection device and vertical stainless steel coil. The burner is operated via a seperate pump and the machine is protected by a low water level device. The Idro 130/10 machine is manufactured from reinforced isolated polyethylene covers, frame and handle and feature an integral fuel and chemical tank. It is controlled by a low volt 24v board, and the machine is protected by a safety valve, thermostat and reload, as well as benefiting from the integral chemical facility.